My skin has had a bad summer. I've been terrible at uploading videos to my YouTube channel and posting photos of my face on here (other than super far away in OOTDs) so I don't think it has been all that apparent to you, but it has really been the pits. But through this bad-skin-season, I've really started to like the brand Indeed Labs, something I tried on the recommendation of facialist Caroline Hirons. I know I go on about her all the time, but she really is wonderful, and I have yet to go wrong with her product suggestions. 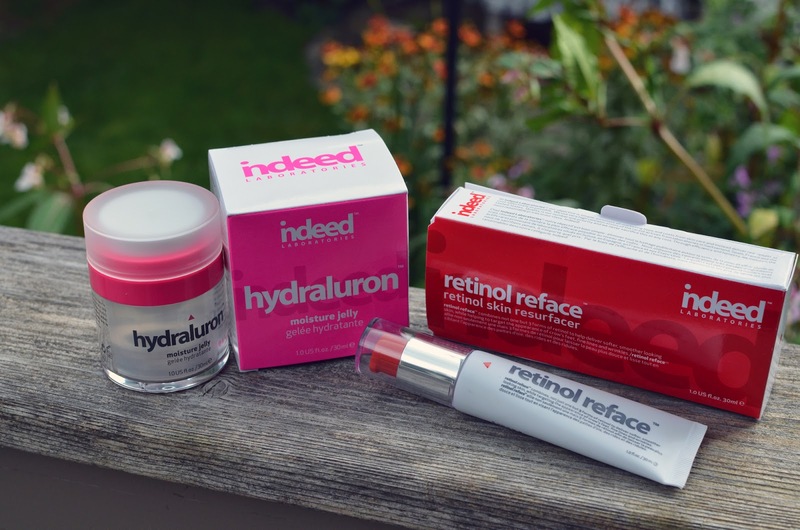 My two latest purchases from Indeed Labs are their new Hydraluron Moisture Jelly (holla hyaluronic acid!) and their Retinol Reface treatment, both available at Shoppers Drug Mart for very reasonable prices... sometimes even on sale. As I'm still (still!) struggling with adult acne, I decided to finally try out a retinol product. The amount of retinol/retinoid in Retinol Reface is obviously less than would be in a prescription product, but for my sensitive skin it has been a good amount to start with. I've noticed a huge difference in the texture and clarity of my skin, with very minimal irritation. I haven't completely cleared up my acne, but the before and after I see every morning in the mirror is really remarkable. For the past two weeks, I've used one pump at night all over my face and down onto my neck. It has quite a siliconey texture which certainly isn't for everybody (including me, normally), but honestly I'm willing to overlook that because the results speak for themselves. The Hydraluron Moisture Jelly is a product I have been excited about for months. I still haven't transitioned into using it full time, as I'd like to use up my La Roche Posay moisturizer first, and my skin needs a longer than normal adjustment period when trying new products. I've used this a few times, and really like the jelly texture and light moisture it provides. I have combination/oily skin and it hydrates without feeling heavy. I'm almost done my LRP Hydreane moisturizer, so this will be fully integrated into my rotation within the next couple of weeks. Stay tuned! Have you tried Indeed Labs? What are some of your favourite budget skincare brands? Essie French Affair and a... Bad Manicure? This may come as a surprise to many of you, but I'm not really a "spa" kind of girl. I hate baths (gross! ), I can't deal with anybody touching my feet, or generally most parts of me, and I'm not good at sitting still. So that rules out most spa services. Another thing that may surprise you is that it's been at least 10 years since I've had a professional manicure. I've been extremely DIY in this area, for money reasons and for lack of time, but when it comes down to it, I can never get my nails to look the way a professional can make them look. All this to say, I got my first manicure in 10 years last week, and I'm still kind of confused as to whether it was a good one or not (I'm leaning towards not). I brought my own polish - Essie's French Affair - because I always get chips by day two, and I wanted to get my money's worth. Not exactly a fall colour but something about it just drew me in! It's a little bit streaky, and I was a little bit shocked when my manicurist put the bottle away after only two coats, leaving some obvious streaks behind. She did a nice job filing and shaping my nails, so from far away it looked fine, but I ended up applying another coat when I got home because it was bothering me so much. But that's not all. She cut me, twice, while working on my cuticles. I bled. Pretty sure you're not supposed to bleed during a manicure?! Maybe she was new, or something. Or maybe my cuticles are just overly sensitive?? The hand massage was nice, and it was fun to hang out with my mom (she got one too) but this foray back into getting my nails done has left me a little bit disappointed. I've found another spot near me that has really good reviews and is significantly less expensive than the place that chopped up my cuticles, so I'm thinking I will try there before I decide whether to swear off manicures forever. Also, is it normal for your cuticles to become crazy dry and peely a few days post-mani? I've been slathering on my Vaseline hand and nail cream but they just keep on shrivelling up. Not the best look. Do you often get your nails done? 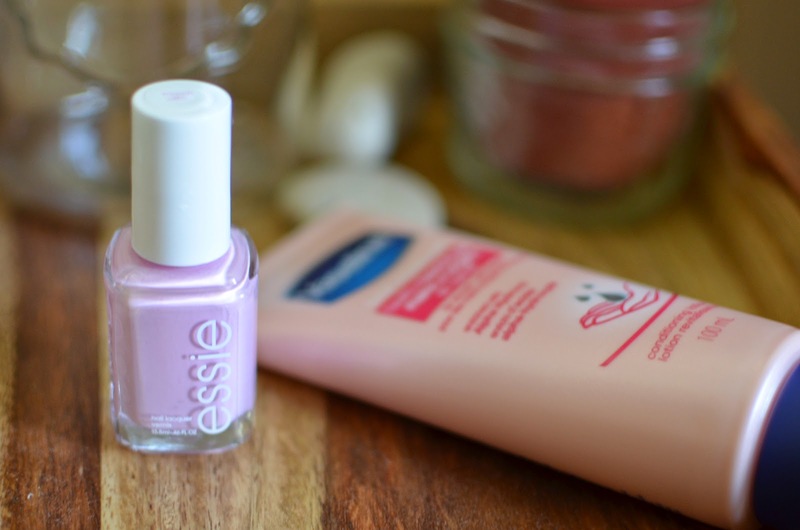 Have you ever bled during a manicure?! Is this somewhat normal?! 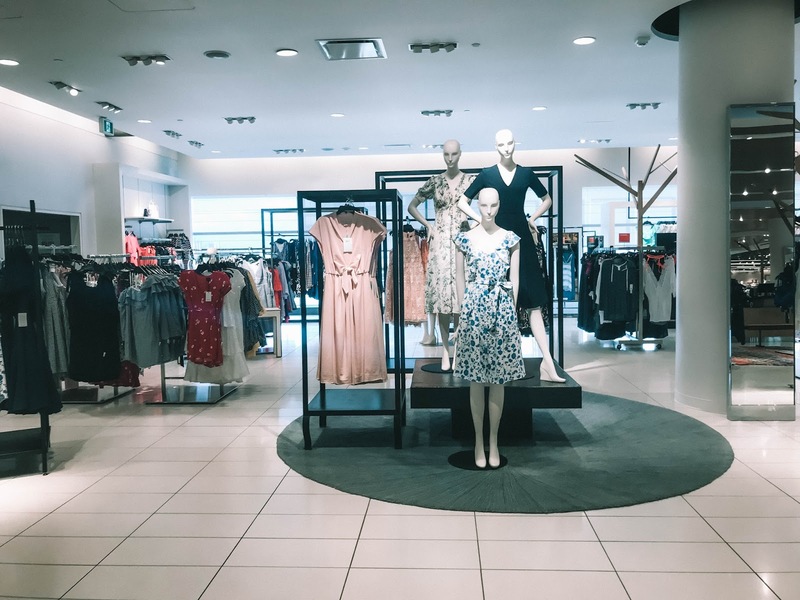 Please let me know about your experiences in the comments!